What is a Goldbug? If we look at Wikipedia, they define it as “a person who is extremely bullish on the commodity gold as an investment and or a standard for measuring wealth …… goldbug can also be used as a pejorative”. Since less than 0.5% of world financial assets are in gold, most people neither hold gold, nor understand the purpose of gold. The people who understand the real value of gold could only agree with one of the definitions above – a goldbug is a gold beetle. There could be no argument about that clear definition. 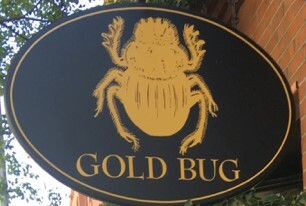 Many people use goldbug scathingly as a pejorative as they have never bothered to understand the significance of gold. So why have I, and a few others, been advocating the ownership of gold for the last 17 years without being goldbugs? It is not because I am bullish on the gold price and want to make a quick buck. Nor is it because I believe in the gold standard (see my article about FreeGold). No, gold has a much more profound significance. The simplest definition of gold is JP Morgan’s: “Money is gold and nothing else.” But his statement requires further clarification. Of course money is gold. That is why gold is the only currency that has survived throughout history. All other currencies have been destroyed by rulers or central bankers by issuing endless amounts of credit and printed money until the currency has become worthless. And this is happening now again as all currencies have lost 97-99% in real terms since 1913 when the Fed was created. If we are not Goldbugs, what is the purpose of holding gold? In simple terms, gold is wealth preservation and insurance against a rotten financial system, inflated by $100s of trillions of credit and printed money as well as quadrillions of dollars of derivatives. 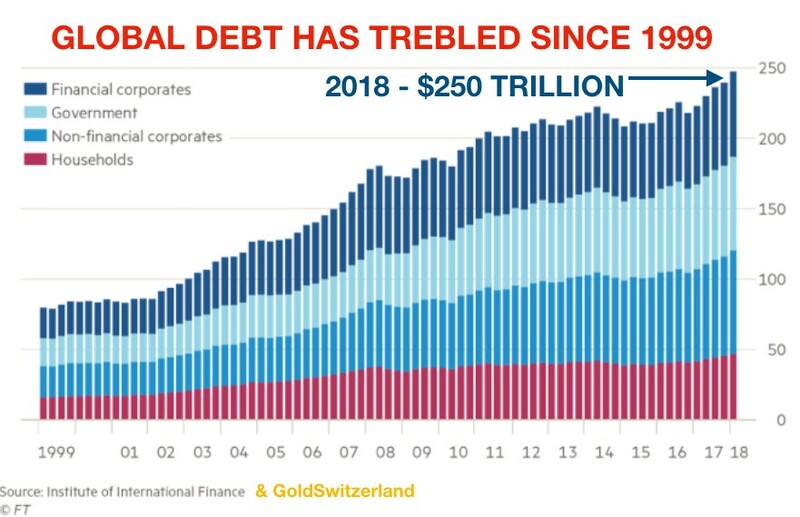 If you understand the bubble that this has created in all asset and debt markets, you will also understand that gold is your best protection against the coming implosion of all these markets. For the ones who think it is different now, I beg you to study history. Every single major asset and debt bubble in history has always resulted in a collapse of the currency and the financial system, where it has occurred. The big difference this time is that the problem is global. World debt at $250 trillion is 3x global GDP – an all time record. And if we add unfunded liabilities and derivatives, total debts and liabilities amount to over $2 quadrillion which is 25x global GDP. So that is the risk that potentially could erupt into the biggest financial and economic collapse in history. There is clearly no certainty that it will happen but the probability is very high. Governments only have one remedy which is to print more money. But even a child would understand that printing more money and issuing more debt to solve a debt problem clearly doesn’t add up. Sadly the Keynesians like Noble prize winner Krugman don’t get it. You can’t solve a problem by the same means that caused it in the first place. – The 97-99% fall of all currencies in the last 100 years will continue until the currencies have reached Zero. So there is only 1% to 3% to go but remember that this fall is a 100% loss value from today. – With leverage of 10-50x banks will not survive the next credit crunch. Add to that their derivatives exposure and a systemic failure is guaranteed. – Stocks have been fuelled by money printing and buybacks and are now overvalued on all criteria. A 90% fall in real terms like in 1929 is likely. The economic and financial risks in the world are today exponentially greater than in the late 1920s. – The 35 year up-cycle in bonds is now a mega-bubble that will implode. It turned down three years ago and rates are now on their way back to above the early 1980s level of 16% for the 10 year US treasury. This is a long cycle and will not happen immediately. As governments print unlimited amounts of money, default or implement moratoria, bond market investors, including China and Japan will dump their US bonds just like Russia has done already. – As governments, in a desperate and futile attempt try to save the system, print endless amounts of money, most major economies will have inflation leading to hyperinflation. Anyone who has lived in a hyperinflationary economy, like Argentina, Zimbabwe and Venezuela knows that their money is totally destroyed. Sadly, few people realise that gold would have saved them. – Contrary to what many people believe, gold has historically performed very well in deflationary periods. In my opinion we will first have hyperinflation as governments try to save the world with money printing. When that fails and asset as well as credit markets implode we will have a severe deflationary implosion. Banks are unlikely to survive this in their present form. As banks fail, so will the money in the bank. Gold will then be money used for payment or barter. – Gold production has already peaked. There have been no major finds since the 1990s. Even if unexpectedly there will be substantial new discoveries, it takes at least 15 years from discovery to production. Thus we will see substantial shortages of gold in coming years. – The gold price is only at the currently ridiculously cheap level due to a paper gold market which determines the gold price whether it is physical or paper gold.. 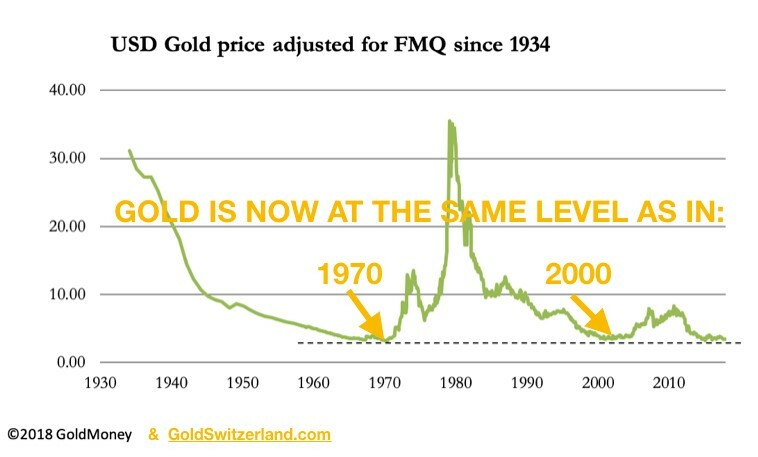 The price of gold adjusted for money supply is now at the same level as in 1970 when gold was $35 and 2000 when gold was $280. Paper gold outstanding is at least 100x the physical gold backing it. When paper gold holders get worried and ask for delivery, there will be no gold available and price will go “no offer” which means there is no gold available at any price. This is when gold will go to multiples of the current price. – Corporate debt has exploded in most industrial nations and is now at danger level. In the US for example corporate debt to GDP has doubled since the 1960s. Irrational optimism and share buy-backs have fuelled this debt boom. – There are a number of other major risks which can erupt at any time. These include geopolitical risks civil war, social unrest, country risk in China, Japan, USA, Middle East, Emerging Markets etc. Many of these things have already started like the US government shutdown, the Brexit fiasco in the UK, Yellow Vests in France and mass migration on several continents. All this is just the beginning. Gold is clearly not the panacea for all the problems listed above. But there is no better insurance against the financial and economic risks in the world today which are greater than any time in history. Especially in periods of crisis, gold is the most important wealth preservation asset as well as a store of value and medium of exchange. Despite, or maybe because of, most people’s total ignorance of gold, it will be the most superb asset to hold in the next few years both as insurance and for capital appreciation purposes. But remember to hold physical gold and store it outside the financial system in a very safe vault and jurisdiction.